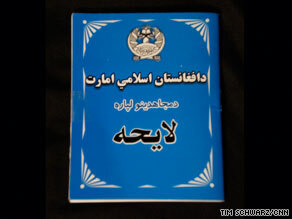 States that "Mujahideen must do their best to avoid civilian deaths and injuries"
Adds that "suicide attacks should be at high value and important targets"
Editor's note: The Taliban has released a new "code of conduct" for fighters in the field, listing what is acceptable behavior and what is not. The following are CNN translations of excerpts from the code. Any Muslim can invite anyone working for the slave government in Kabul to quit their job and remove themselves from the corrupt administration. The new code of conduct issued by the Taliban originated from Pakistan. It is strictly prohibited to exchange prisoners for money. Killing can only be decided by the Imam or his deputy. Noone else has the right to do so. If a military infidel is captured, any decision to kill, conditionally release or exchange such a prisoner can only be made by the Imam or his deputy. Suicide attacks should be at high value and important targets because a brave son of Islam should not be used for low value and useless targets. In suicide attacks the killing of innocent people and damage to their property should be minimized. All Mujahideen must do their best to avoid civilian deaths and injuries and damage to civilian property. Weapons used to be taken from people by force, this practice is no longer permitted. But people may hand over their weapons voluntarily. No Mujahid is allowed to smoke. Analysis: Why are Taliban issuing code of conduct? A male who has not yet grown a beard may not stay in a common sleeping area with other men. It is forbidden to disfigure people. For example the cutting off of ears, nose and lips are severely prohibited. Mujahideen should refrain from such activities. Mujahideen of the Islamic Emirate should not collect donations from people forcibly. People should be free to choose who they want to give to. Mujahideen should not search people's homes. If there is a need to do this, they should get permission from authority and the search should be done in the presence of the imam of the local mosque and two elders. Kidnapping for ransom is strictly prohibited. Mujahideen must be well behaved, and treat the people properly, in order to get closer to the hearts of civilian Muslims.